The Blessing of St. Panteleimon FC and presentation of the new kit - ELLINIKI GNOMI • Die Zeitung der Griechen in Europa. St. Panteleimon FC begins its new season at the Premier Division of the Middlesex County Football League on Saturday 18thAugust 2018, playing away in Rectory Meadows against PFC Victoria London, a very strong and very well organised opponent. 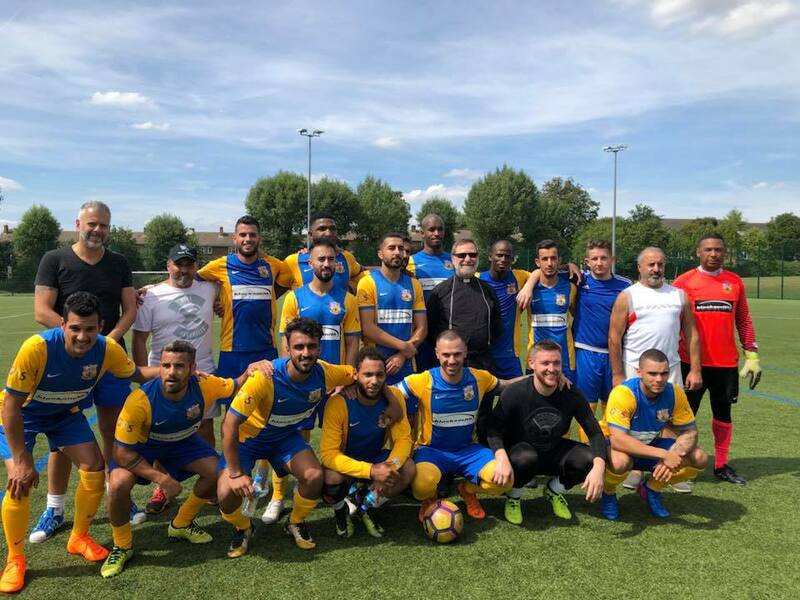 The official beginning of the new Football season 2018-2019 for the “Saints” had actually taken place on Saturday 4thAugust, when Fr. Anastasios D. Salapatasofficiated at the blessing of the Team in St. Panteleimon and St. Paraskevi Church in Harrow – NW London. The Blessing was attended by many Players of our Team, our ManagerGeorge Frangeskou, the ChairmanSavvasAndreou, Committee Members, Sponsors, some passionate fans and others.The sports journalist GeorgeMichaelides attended the ceremony and gracefully greeted our Players! “Heavenly King, who through Your Holy Cross and the Glorious Resurrection smashed the devil and having abolished the death gave life to us, You granted health and strength to our body and healed our illnesses, and You have also provided those we struggle the good fight and with honesty complete their way with the crown of victory. You, our Lord, bless this Football Team, its Managers, its Committee, its Sponsors and those who assist, and above all its Players to receive strength with the force of Your power, in order to exercise their bodies and souls and worthily achieve the prize of victory. Make our sports facilities an arena of noble competition and legitimate exercise, and to all those who practise sports there, send Your blessing. Thus, we beseech You, make us worthy of Your calling and grant us health and prosperity making us good imitators of our Patron Saint, Saint Panteleimon, the Great Athlete and Healer, who fought the good fight and was glorified by You. For You are a merciful God Who loves mankind, and to You we send up Glory, to the Father and to the Son and to the Holy Spirit, both now and ever, and to the ages of ages. Amen”. At the end of the ceremony Fr. Anastasios greeted everyone with warm words, emphasising the importance of our Faith (the Team’s motto is: Faith First) as well as of the Greek Orthodox Community connections. The Players and all those attending came forward, kissed the Holy Cross and were blessed with the Holy Water. Right afterwards they all moved to St. Panteleimon Community Centre, where there were refreshments offered to everyone. Then the new kit (new design in the “Saints” colours) was presented and the official photographer of the Team AlexiosGennaris took pictures of the individual Players, of the Committee and of everyone attending. The new kit was sponsored by Harry and Katerina Demopoulos, of Tower London! We are really grateful to them for their kindness and generosity, as well as of their commitment to our cause. The kit was produced in Thessaloniki by the Active Cap Athletic Company, with whom we are establishing a new partnership! Really exciting times! Later on in the afternoon of the same day St. Panteleimon FC played a friendly game away against South Kilburn FC. The result was 1-1 (scorer Nikos Salapatas). The “Saints” had so many chances and had dominated the whole game. They hit the cross bar twice and they even lost a penalty! The “Saints”are now really looking forward to a great and successful season ahead!